Most students entering an electronics technician program have an understanding of mathematics. Basic Electronics Math provides is a practical application of these basics to electronic theory and circuits. 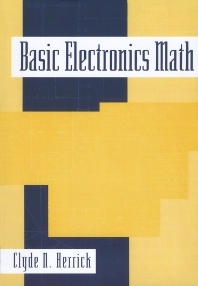 The first half of Basic Electronics Math provides a refresher of mathematical concepts. These chapters can be taught separately from or in combination with the rest of the book, as needed by the students. The second half of Basic Electronics Math covers applications to electronics. Clyde Herrick is a former instructor with San Jose City College in San Jose, California.